Just in time for the colder months of winter, Sierra Nevada Brewing Company (Chico, CA) has released its version of a Russian Imperial Stout. For most beer geeks (myself included) the reputation of this brewery alone was enough to become excited to try this beer. However, another factor that some people I spoke to also considered was how much of the brewery’s love for hops would impact the aroma and flavor of this big dark beer. 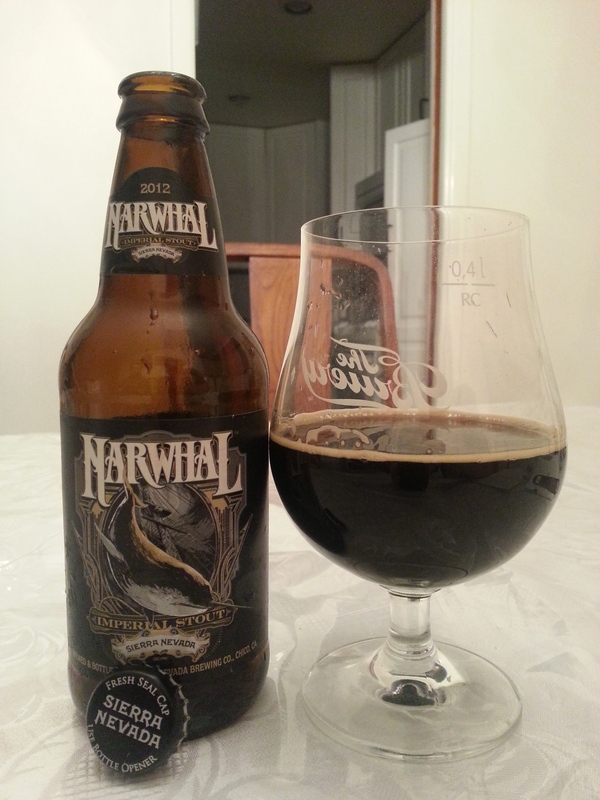 Therefore, after buying a 4-pack of Narwhal I made sure to write down tasting notes while drinking my first bottle so I could share my thoughts on it with you. Being that I was going to be drinking other higher abv beers that night I chose to split the 12oz bottle with my brother (see above picture). Narwhal poured opaque black with a half finger khaki head that quickly dissipated, but left attractive dots of lacing and alcohol legs on my snifter. Overall, a pretty nice looking imperial stout. Initially the aroma was comprised of big and bold roasted malts and espresso coffee with hints of cocoa. This got me a bit worried that the beer would end up tasting like an average roasty stout. Adding to this concern my first few sips were quite similar to the aroma with a touch of added chocolate in the finish. Then as with most Imperial Stouts the beer’s underlying complex flavors slowly emerged as it approached room temperature. Once the roasted malts and coffee hit my palate upfront, tasty semi-sweet dark chocolate notes added sweetness and depth at midpalate, and a bit of cocoa and earthy hops rounded out the finish. My last few sips were the most enjoyable because the hop flavor intensified quite a bit with floral, pine, and earthy notes that reminded me of some Black IPAs that I’ve enjoyed in the past. This entry was posted in Beer Reviews and tagged beer review, chico, craft beer, Ken Grossman, Narwhal Imperial Stout, Russian Imperial Stout, Sierra Nevada Brewing Company. Bookmark the permalink. I picked up a bottle of this at Belmont Station last time I was in Portland. I had heard a lot about it and was assured it was a good beer. But after a weekend of sampling world class beers at the Portland Winter Beer Festival, this one was very middle-of-the-road. Not bad, by any measure, but it didn’t really stand out either. I guess that’s SN’s strong point though, right? They make incredible beer that won’t offend anyone, and can be enjoyed by all. Yes this is SN’s strong point. Consistent dependable and good tasting beers.